No man can resist the urge of the flesh... the twisted glee of killing for money. The Guild Ataer supplies those who have that need with jobs... as assassin, thieves, or mercenaries. Even though they are a "Dark" guild, they have a creed that they never break; Never betray your employer. 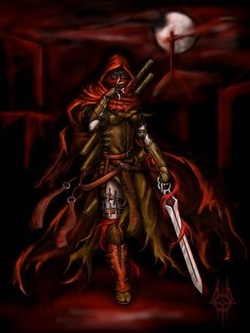 This is a creed that even the dirtiest of assassins stick to, for fear of death by the one known as "Crimson"
Class Bonus: +2 DEX, +1 SPD, Starting Skill: Stealth.